The hearings are at the Commerce Department, specifically, and will be happening all day, as automakers, parts suppliers, ambassadors, and a host of other interested parties hope to convince the Trump administration not to impose any further tariffs on the cars. Another hearing is set for tomorrow. As testimony kicked off, Ann Wilson of the Motor and Equipment Manufacturers Association testified that a survey of parts manufacturers shows that 80 percent of respondents said that if tariffs are imposed, the businesses would cut jobs, delay research and development and shift jobs outside the U.S.
On Wednesday and Thursday, major auto trade groups, including organizations representing Detroit’s automakers, international automakers, auto dealers and parts suppliers, sent a letter to Trump and ran full-page ads in the Wall Street Journal and POLITICO, as well as on other media websites, asking the president not to approve the tariffs if they are recommended by Commerce after the hearing and investigation. “Just one of out 45 witnesses today is expected to testify in favor of imposing tariffs on autos and auto … The lone exception is Jennifer Kelly, research director of the United Automobile Workers, which revealed its support in public comments filed last month with the department. “Nearly all of the 44 other witnesses filed comments expressing opposition to President Donald Trump’s threat to impose a 20 or 25 percent duty on foreign-made autos and parts. Those include the Alliance of Automobile Manufacturers, which represents Ford, GM, Fiat-Chrysler, as well as foreign brands such as Mercedes-Benz, Honda, Toyota, Hyundai, Volkswagen, Nissan and Subaru. The UAW agreeing with the Trump administration is about as weird a political alliance as we’ve come to expect in this strange age. The company’s CEO Hakan Samuelsson told Reuters that they will move some production of XC60s intended for the U.S. market to Europe from China to avoid tariffs imposed on Chinese imports by the Trump administration. Samuelsson also said that, hey, by the way, Volvo remained hugely profitable. Acquired by Geely in 2010, the premium car manufacturer has achieved four straight record sales years, raising its game against bigger rivals Mercedes (DAIGn.DE) and BMW (BMWG.DE). Net income rose 40 percent to 3 billion Swedish crowns ($337 million) in the three months ended June 30 on revenue of 66 billion, up more than a quarter. Operating profit amounted to 4.2 billion crowns, with 3.7 billion in positive free cash flow. Geely is preparing Volvo for an IPO that could value the automaker at up to $30 billion, according to Reuters, meaning that, for now, the tariffs are more of an annoyance, though that could change swiftly if Trump follows through on threats to impose tariffs on cars imported from Europe. Volvo also recently opened a $1.1 billion new plant in South Carolina, a further hedge against any future tariffs, though that plant will not be running at full capacity for a few years. Geely - which hopes any IPO will command a high valuation reflecting Volvo’s big plans in autonomous, electric and subscription-based motoring - has acknowledged the problem. 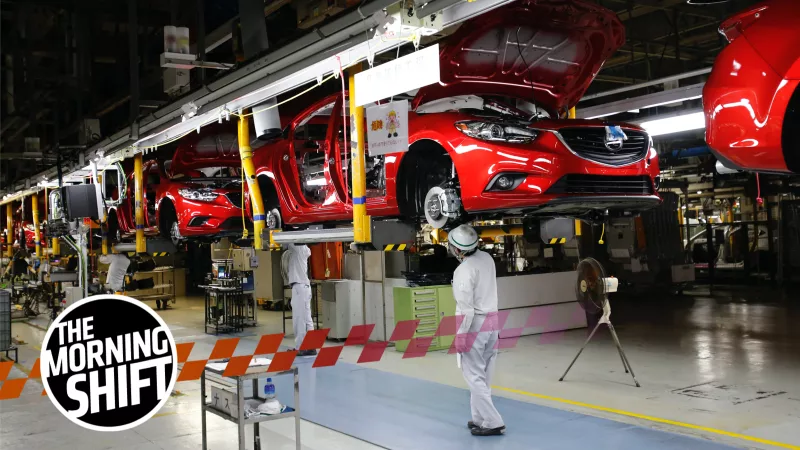 Speaking in Hong Kong last month, Geely Chairman Li Shufu said higher tariffs would bring price increases and may ultimately force Volvo to diversify its U.S., Chinese and European production to assemble more models in each region. “We will have to invest in producing a higher number of car models locally,” the South China Morning Post quoted him as saying. Now people within the Sierra Club are mad at Brune over the whole ordeal, according to Bloomberg. They objected to Brune’s defense of an executive who funds Republicans and has bashed the United Auto Workers. Elon has given over $6 million to the Sierra Club, but had done so anonymously. His call to Brune was a request to make those donations public, after it had emerged that Elon had given thousands to Republicans. Those donations were probably less politically motivated than intended to help Elon specifically. But, still, the optics were bad. It’s good to have friends, I guess, who you can turn to for a very minor PR win in the near-term and an embarrassing story in national media a few days later explaining how you got that PR win. We’ve know that recall tracking in the U.S. could be improved, but a new government audit of NHTSA confirms that, with NHTSA’s inspector general saying that the recall procedures have been bad and possibly dangerous. The report found that in the massive Takata air bag recalls, the agency did not follow its own procedures to address low recall completion rates and its “delayed action to investigate” complaints may have delayed the expansion of the recalls. At least 23 deaths worldwide are linked to faulty Takata air bag inflators rupturing and sending deadly metal fragments flying, including 21 in Honda Motor Co (7267.T) and two in Ford Motor Co (F.N) vehicles. In a statement, NHTSA did not directly address specific concerns raised. “NHTSA is dedicated to continuous improvement of the risk-based processes addressing potential safety defects and recalls,” the agency said on Wednesday. NHTSA said in a letter it did not endorse all of the report’s findings, but agreed to some recommendations sought by the inspector general’s office. The audit said “inadequate controls and processes for verifying and collecting manufacturer-reported information have hindered NHTSA’s ability to oversee safety recall implementation.” The audit projected that nearly 11 percent of auto vehicle recalls issued between 2012 and 2016 did not include documents required by law. Most people are reasonably conscientious about getting their recalls fixed, but it’s the minority of folks who aren’t who need the most attention. Is your car under recall? There are a lot of ways to find out, but the easiest is to enter your VIN here. And will probably miss next week’s quarterly earnings conference call. Marchionne is already on his way out at FCA, though I hope he gets better first. Lettera 43, an Italian business website, said Marchionne likely will miss the quarterly conference call. It did not attribute the source of its information. The report did not give details about the surgery. Marchionne, 66, did not respond to a text message from Automotive News on July 6 inquiring about his health. Marchionne — who has been a heavy smoker — is in his final year as CEO of the company, having joined a then-struggling Fiat in June 2004. For their part, FCA said that the timeline of Marchionne’s departure will remain fixed, though the company has not said when, exactly, Marchionne will leave or who his successor will be, except to say that the successor will come from within. Neutral: When Was the Last Time You Were Surprised to Learn Your Car Was Under Recall? I think I get the notices, and yet it seems like every time I go to the shop they tell me a new recall is being fixed.